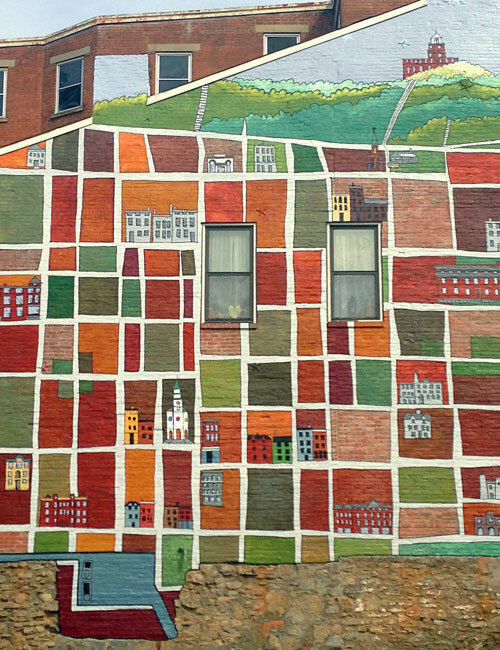 David and Barbara Day are long-time Over-the-Rhine residents whose work documents and elucidates the histories of Cincinnati neighborhoods and landmark architecture. 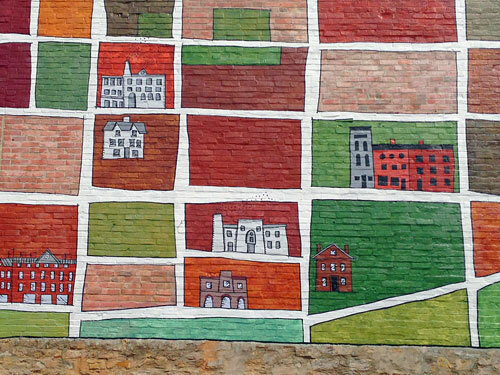 This summer, they designed a new ArtWorks mural located on Pendleton St. right across from the Pendleton Art Center. 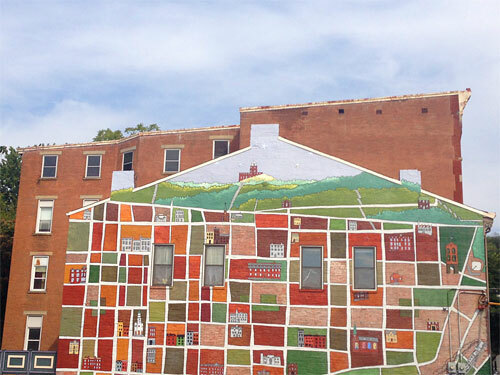 The mural is painted on a former interior wall that was never intended for view or exposure to the elements [see the “before” photo]. 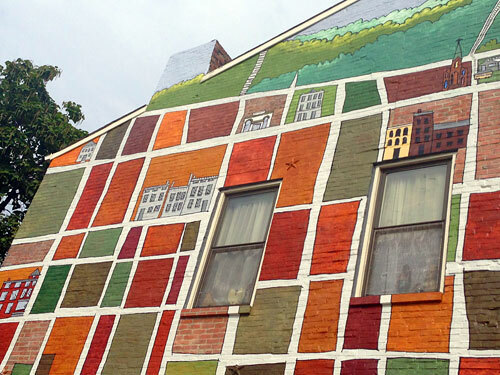 It incorporates four windows into its design, which is a primitive neighborhood map, almost as if a child had drawn it. At the top, we see the hillside and sky. 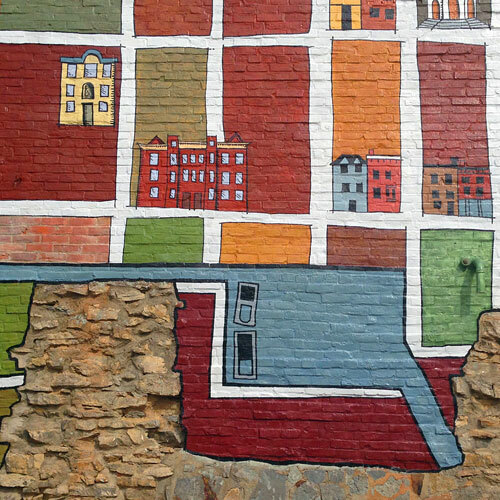 Along the bottom, the mural ends where the bricks end. The color palette is bright but earthy, its tones reflecting the colors found in neighborhood architecture. This is a rather trite observation, but the mural is cute and fun, making a visual impact from a distance but also offering a ton of detail for close examination. The lead artist on this project was Michael Stillion. 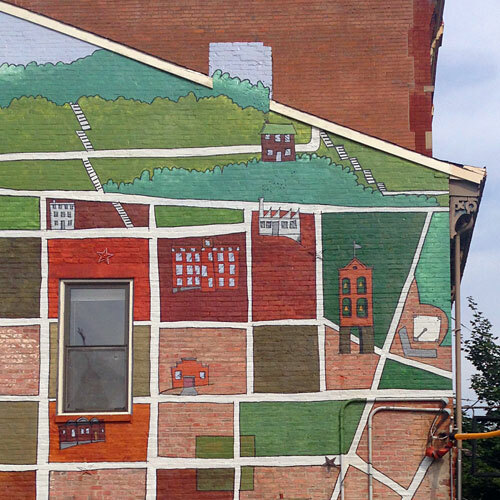 Two years ago, he worked with ArtWorks apprentices on a fun 3-in-1 mural on Main St. in Over-the-Rhine. I hope he’ll have the opportunity to paint more murals of his own design soon. This might be my favorite of this summer’s murals. 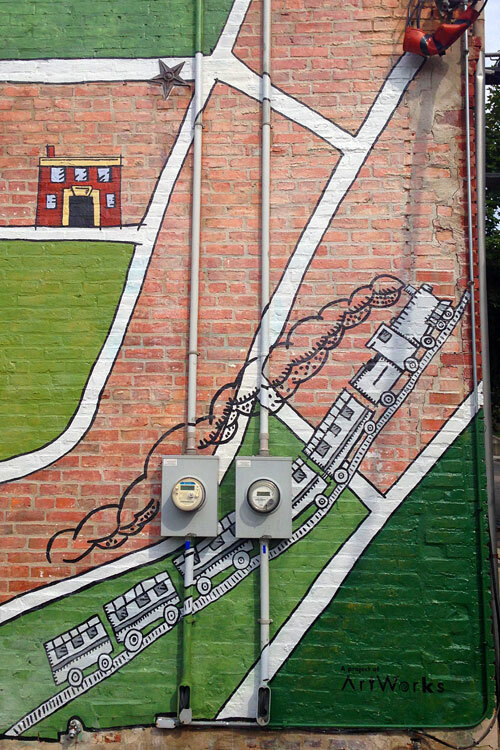 This mural’s awesome! I actually just read that the b/w buildings no longer exist, while the color ones still stand, so that adds another layer of meaning to the map.